Ideally suited for those discerning guests, who want a quality spacious residence, in a quiet and desirable location . Private Detached villa with pool in large mature garden. Wi-Fi. A homely 4 Bedroom detached private Villa, with pool and large garden. Wi-Fi. 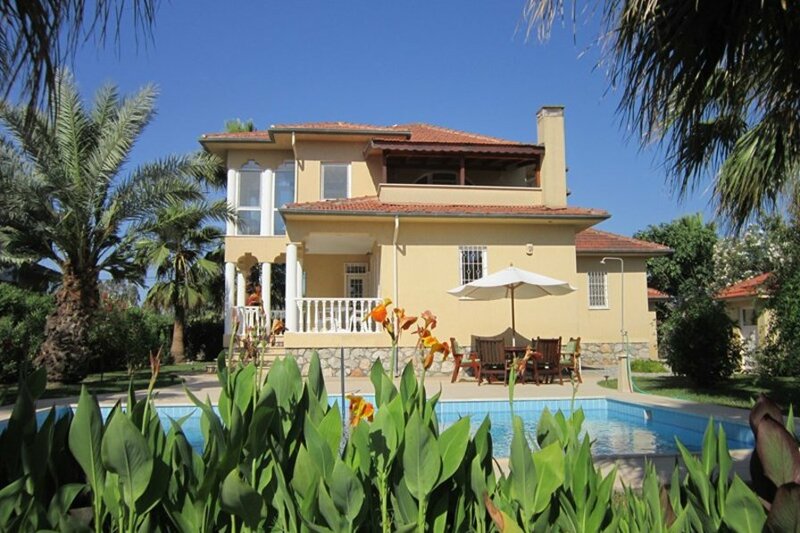 Set in a beautiful garden, in a peaceful area on the fringe of Dalaman. Villa Serenity with its beautiful private pool offers excellent accommodation (sleeps 8) and facilities for all the family. The villa benefits from both space and privacy, with splendid views of surrounding mountains and countryside. A magical place to relax in. Set in mature gardens with many fruit and palm trees. The garden is completely enclosed by a stone wall with lockable gates for child safety. Villa Serenity is one of 6 individual properties on a private lane in an area of natural beauty and yet only a 5 min car journey or approx. a 25min walk from the centre of Dalaman. To the front of the villa is a pomegranate orchard and to the rear, fields of oranges, with beautiful mountain views as a backdrop. The villa has everything you need to enjoy a home from home environment, with the added bonus of azure skies and beautiful sunshine. Villa Serenity’s outside areas have been arranged with relaxation in mind. Either on the sun loungers by the pool, the upper balcony reading/relaxing area, with those splendid views perhaps, or maybe a seat in the Jasmine scented pergola. All are there for your enjoyment and relaxation. The garden is arranged so that both sun and shade are available in various areas of the garden all day long. Sun worshipper or shade magnet, everyone is catered for at Villa Serenity. LIVING ROOM: 1x 4-seater and 1x 2-seater sofa's, 2 arm chairs, coffee table, bookcase with a selection of books for your enjoyment. T.V, DVD player with a selection of films, iPod docking station. A patio door leads onto the large covered terrace suitable for dining or just relaxing. KITCHEN/DINING area: Full kitchen with necessary appliances and an abundance of crockery, cutlery, pots/pans, glasses. There is a microwave and dishwasher. A real home from home kitchen, with a bright and airy aspect. UTILITY STORE: iron, ironing board, cleaning materials, vacuum cleaner, fridge/freezer. BEDROOM TWO: air conditioned; king size bed; wardrobe, chair and chest of drawer's. BEDROOM THREE & FOUR: air conditioned; 2 single beds in each; wardrobes, chairs and drawers. Bedside locker. FAMILY BATHROOM (Upstairs): large corner bath with Shower; WC and wash hand basin, with plenty of storage for toiletries. SECOND FAMILY BATHROOM (Downstairs): corner shower; WC and wash hand basin, with plenty of storage for toiletries. CLOAKROOM (Downstairs): WC and wash hand basin, with plenty of storage for toiletries. MEDITATION/RELAXING ROOM: private seating area with stunning views of the surrounding countryside. If you can manage to tear yourself away from the tranquillity of Villa Serenity there are many things to do locally. The Dalaman market on a Thursday is not to be missed. Lots of variety of fresh and tasty produce on display. A must; enjoy a freshly cooked pancake from one of the stalls. For everyones peace of mind, Rental Terms & Conditions are binding on all Renters of Villa Serenity. If you wish to read the T&C prior to booking, please request your copy directly from the Owners..
Dalaman is an area of breathtaking natural beauty located between the sea and mountains, with fragrant orange groves, lovely unspoilt beaches and fascinating ancient sites. The ideal base to explore from or just relax in the rural setting. Dalaman is rapidly becoming an area of destination rather than just a stop over on the way to some other resort town. Over - development and exploitation of the area is stopped by the protection afforded to the rare loggerhead turtles that frequent the river and beach. Ensuring Dalaman develops in harmony with its surrounding environment and retains its natural beauty. AKKAYA GARDEN RESTAURANT - one of the best restaurants in the Mediterranean Region. There are plenty of places to dine in the garden with secluded seating areas or in a storks nest. The nests are positioned in the trees and can sit 4-8 people. The restaurant is located deep in the valley amongst the pine trees. It is set amongst waterfalls, ponds, wildlife and beautiful trees and flowers. The food is second to none with an excellent selection of both Turkish and European cuisine. NAR RESTAURANT - attracting locals and tourists alike, Alfresco dining in the town centre. Wonderful Turkish and International cuisine and specialist coffees make this a popular venue. BOTANIK RESTAURANT- Situated just a few miles from Dalaman this is a great restaurant at any time of the year. In winter it has a homely feel with a large open fire, for dining inside the restaurant. In the summer all meals are served alfresco in the beautiful gardens. Each table is discreetly placed for privacy. The food is scrumptious and offers everything from fish, meat and vegetarian dishes. Included within the price are homemade bread, cheese and local butter to get you started. Your chosen main meal selection, followed by local fruits of the season. CINAR RESTAURANT- Serving traditional Turkish meals in a relaxed garden setting (in summer) with live music on a Friday evening. In winter the interior is cosy with warmth from the log burner. Fantastic steaks but also vegetarian and fish choices . Also a great place for the traditional Turkish breakfast, at 15 lira per person this is guaranteed to fill you up until dinner time. BLUE RESTAURANT- Situated just a short car journey from Dalaman, this restaurant sits directly overlooking the marina in Gocek. Although a little pricier than the other restaurants mentioned, it is well worth a visit. If you visit on either a Tuesday or Thursday they offer 2 main meals for the price of one. Serving traditional Turkish food, plus the odd surprise! This is just one of several excellent restaurants overlooking the sea in Gocek. You could also eat at KEBAP HOSPITAL for the novelty value of the name as well as the excellent kebabs and meze. SARIGERME BEACH : with 4 miles of golden sand, shallow sea and the island of Babada not too far in the distance, is a great day out for all the family. A short walk along the wooded footpath with its turkeys, chickens and peacocks running free, brings you out onto the exceptionally clean beach. Facilities include food and drink outlets, water sports, showers, toilets, beach chairs, umbrellas and dressing cabins are all available. SARSALA BEACH : is a lovely family beach set in a small bay with a restaurant, changing rooms, shower and W.C. The beach is 6 miles from Dalaman. There are daily "12 island" boat trips available from the small pier price is 40tl (2010 prices) per person and includes a BBQ lunch. WHITE-WATER RAFTING : In Dalaman is one of the most exciting holiday experiences and is perfect for active thrill seekers. The Dalaman River is rated as one of the top rafting destinations in the world. Professionals will guide you every step of the way for an unforgettable adventure on the Dalaman waters. THERME MARIS SPA : You can buy a day pass to use some great facilities including massage, fitness centre, beauty centre (skin care centre, aromatic bathtub, solarium, peeling, hamam, sauna, pressotherapy, starvac, thermo failure), 3 different outdoor pools with thermal natural water, indoor pool, jacuzzi and mud bath. You can see and feed the endangered Loggerhead Turtles. Located immediately behind Dalaman Beach. IZTUZU BEACH : Visit one of the most beautiful beaches on the Mediterranean coastline. This sand bar that separates the sea from the mouth of the Dalyan Creek is an excellent swimming beach. Situated 30 minutes from Dalaman, Iztuzu Beach has also been preserved, as it is one of the last nesting grounds for the endangered Loggerhead Turtles. GOCEK : Often referred to as the St.Tropez of Turkey, with its exclusive yachting marina and unspoilt beaches, Gocek has emerged as one of the countries most affluent areas to live in Turkey. Take the 12 Island Boat Excursion great day out for all the family. The market takes place on a Sunday, ideal place to buy leather goods, local crafts donï¿½t forget to haggle! DALYAN : Only 20 minutes drive to the west from the Villa, you will find Dalyan, a small but exquisite fishing town, which lies next to a meandering river, teaming with wild life. After spending your time browsing the typically diverse Turkish market stalls, why not relax and take a look at the Lycian tombs, carved into the rock face, from the comfort of one of the many romantically set restaurants lining the Dalyan riverside. It only takes you a few minutes from the centre of town to stroll through to the Old Dalyan of gardens and willow trees, to flavour days gone by. KAYA KOY : Once a thriving Greek village, this town of over one thousand houses, two churches, fourteen chapels, and two schools, was completely deserted in 1923 when the 25,000 Greek inhabitants living there, along with more than a million other Greeks living throughout Turkey were repatriated to Greece through a massive government mandated population exchange between the two countries following the Greek war of independence. Since then, the village of Kayakoy, as it is called in Turkish, or Karmylassos, as it was called in Greek, which had been continually inhabited since at least the 13th century, has stood empty and crumbling, with only the breeze from the mountains and mist from the sea blowing through its empty houses and streets. A wonderful place steeped in history that touches you to the very soul. Nearby is the town of FETHIYE with lots of tourist facilities, a seaside promenade which stretches for miles and a large market each Tuesday. Close by Fethiye are the tourist areas of Oludeniz and Callis Beach. Fethiye is about a 45 minutes drive along the main coast road from Villa Serenity. KAUNOS : Visit the ancient ruins of Kaunos, situated approximately 40 minutes from the villa or take the rowing boat ferry from Dalyan and enjoy the 20 minute walk to the site. Amongst the ruins of the city, you will find an old theatre, a large rectangular building that was probably a temple, others of uncertain description, a Byzantine church, and very curious rock-hewn tombs. Wild tortoises are often spotted here. SULTANIYE HOT SPRINGS & MUD BATHS : Situated just before Dalyan Creek joins the lake, you can give yourself a body pack of mud and then wash it all off again in a sulphur pool with temperatures as hot as in the Sultaniye Baths. TURKISH HAMMAM: Make sure you experience a traditional Turkish bath (hammam) before you leave. There are several locally and each has either mixed sexes, or ladies only at special times. I bet you thought you were clean until you see what comes off after a good exfoliation. SAKLIKENT GORGE : the ideal place to visit if you are feeling especially hot. The gorge is 18km long and so steep and narrow that the sun does not penetrate, so the water is icy cold. The gorge is approached along a wooden platform but you can then wade and climb waterfalls to explore deeper in to the canyon. At the entrance to the gorge there is a restaurant with a series of wooden platforms suspended above the water. Trout is the speciality. EPHESUS: why not explore the well preserved marble ruins of the ancient capital of Roman Asia, with its 25,000-seat Great Theatre. One of Turkeys most visited tourist sites; Ephesus was once the home to the Temple of Artemis, one of the Seven Wonders of the World. Situated on the West Coast, Ephesus is a good 3 hour drive from the Villa. We can recommend nearby guest houses if you want to make it an overnight trip. Beautiful mountain and countryside views. Please kindly note that pool towels are not provided.